First I want to talk about the low points. Today a lot of slides were noticeably worse than yesterday. Many speakers had text-only slides. The winner in this category was cisco: The slides in their keynote were crammed with graphics and unreadably small text, all whacked together in an ugly design. The delivery was not very good as well. The HTC keynote was quite good for the first half, but the second half was “death by powerpoint”. Lots of code on slides - do I have to say any more? Also, the “endless supply of coffee” has actually stopped a few minutes ago - but for a coffee addict like me that’s probably a good thing. Aside from that it was an awesome day. I again met a couple of very nice and interesting people, and most of the talks were good. 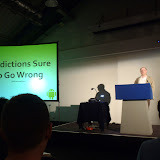 The keynote “Predictions sure to go wrong” was really entertaining - The excellent delivery more than made up for the text-only (and text-laden) slides. Another high note was “Designing UIs for Phones and Tablets” by Google-emplyee Nick Butcher. He gave many useful tips for designing user interfaces that work well on different form factors. He told us not to focus on “Tablet Version vs. Phone Version”, but rather on “this is my one column layout, and that is my two column layout” (or whatever different layouts are supported by the app). The talk with the best title was “Developer’s Guide to the Parallel Universe” - A talk about “Marketing Stuff” by WIP’s Caroline Lewko. It was really interesting - a “must have been there” for people who want to make money with their apps (or even depend on making money). The funniest talk way about the game “Ahhh Pah!” by one of the developers. Very entertaining, and a great story. The best part IMHO: He was talking about when their game was first pirated, and he showed a picture of his kids - “I have to feed them! I need the money! And they just hacked our game!” (yes, he really spoke in bold). My conclusion: Coming here was totally worth it. I hope I can come next year, and I’ll try to get to DroidCon Berlin too.